Living 1 hour away from the race site made it very convenient, as I got to spend the night in my own bed and not worry about the packing my pre-race meal. Hopped in bed around 9p, but unfortunately did not fall asleep until around 11:30p. Alarm went off at 4:15a, had my ritual cup of coffee and cinnamon raisin English muffin, and flew out the door at 4:45a to Colonial Beach. The drive was quick and traffic wasn’t bad. 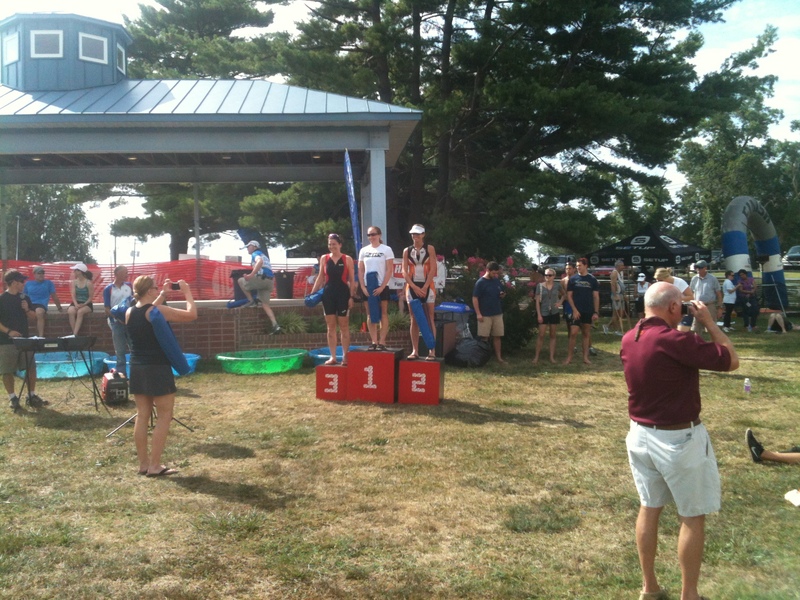 Colonial Beach is a great venue for a sprint triathlon. There was ample parking for the participants and spectators, plenty of room for the transition area, packet pickup, and post-race meal and awards area. I didn’t feel crowded or packed into a small area. Packet pick-up was very smooth and fast. Participants were able to pick up their packets the night before or the morning of. By the way, the swag wasn’t bad for a little sprint. The transition area was a grassy area set up by race number and there was plenty of room for each person to have their own space. I was very happy with the room I had to set up. Could not have asked for a better swim venue. The beach was a little pebbly, but mostly thick-grained sand that didn’t stick to your feet requiring you to rinse in T1. The water temp was a toasty 84 °, NO WETSUITS. 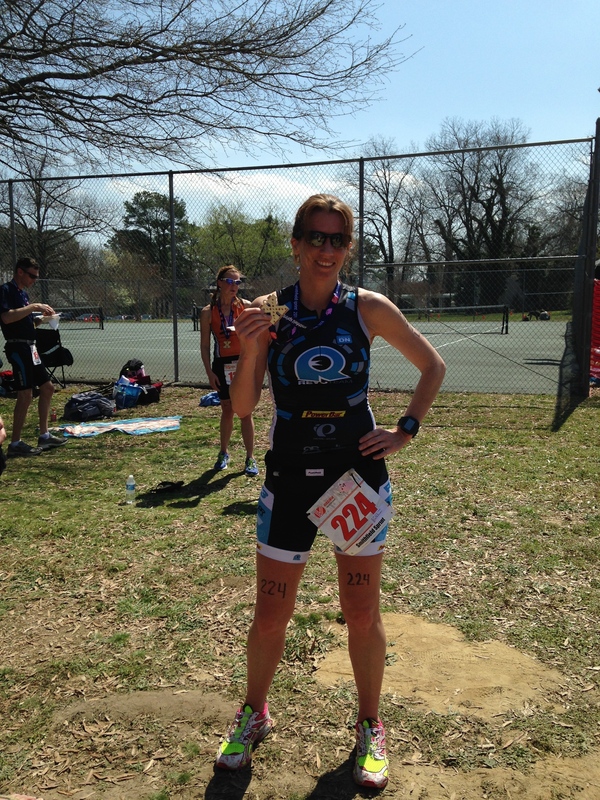 It was a great day to tryout my new Zoot Ultra Speedzoot Race Suit in race conditions. 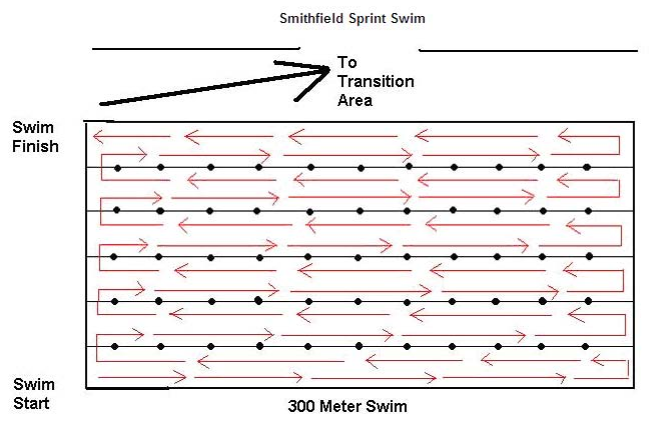 The swim course was well-marked in 250m segments moving counterclockwise. The current wasn’t too strong, just a little choppy. I had heard of there being a problem with jellyfish in years past, but luckily we had no problems this year. I started in the middle of the group, knocked around a bit between other swimmers. I had an issue getting into a good breathing rhythm at first, but was good by the first buoy. Moving across from the first to the second buoy I felt the current moving into the shore and breathing on my left resulted in mouthfuls of water. Pace picked up as I rounded the last buoy as the current was now working with me. Overall I feel that I had a good swim being the 6th out of the water in my wave. The Speedzoot was definitely a great investment. I was confident in the water and felt like I was gliding through, no drag. The Speedzoot came off very quickly and easily, probably helped that I used Tri Glide before I put the suit on. I would start on the right side of the group so that I would be on the inside, closest to the buoys. I will work on my breathing technique to get into my rhythm a little sooner. The run to the transition area was not very far, I should have run a little harder. As I had said earlier about the beach the sand did not stick to your feet. I had a rinse bottle but didn’t need to use it. Slid the speed suit off and my bike equipment on. The run to the bike mount area is a rocky driveway-like area with grass on either side. I stayed of the rocks protecting my tires. I ran with my bike shoes on, but I think that I would do better to practice getting on the bike with the shoes on the bike. Fantastic bike course! 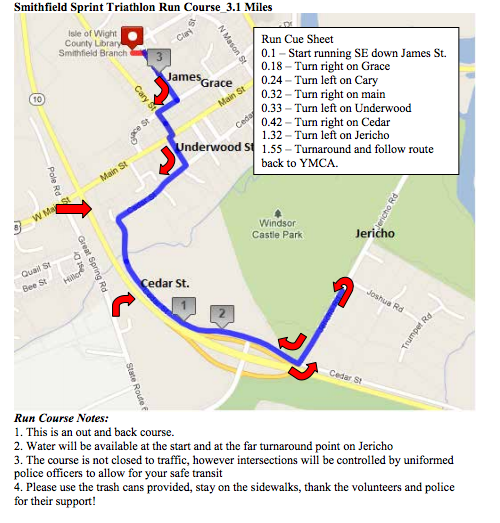 The course was fast, a few slight rolls and false flats. The roads were conditions were excellent. The local law enforcement controlled the traffic very well, but I did not like that the roads were open to traffic. It made it difficult to pass having to pay attention to upcoming vehicles. 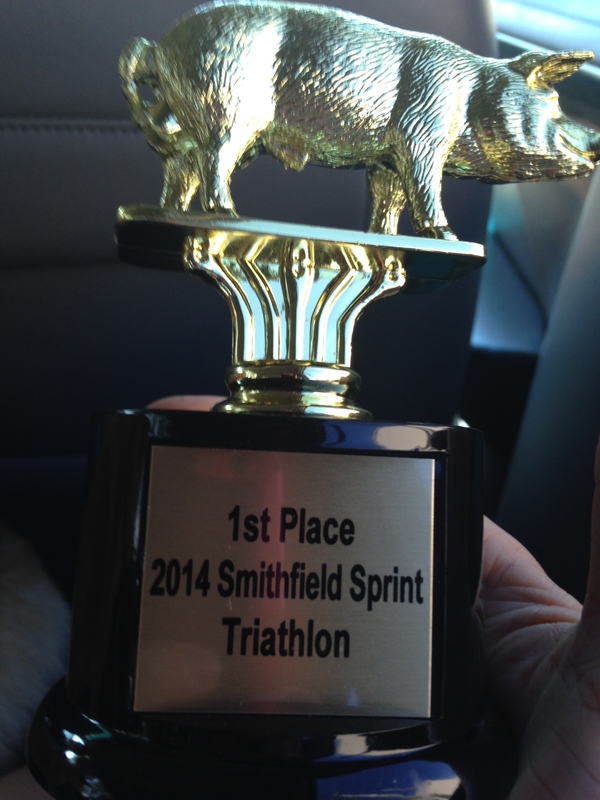 My average speed was just over 20mph, I had the 2nd fastest bike split in my age group (30-34). I am very happy with my bike leg. I used a Gu half way through the bike for it to kick in for the run. As I said about my T1, I need to learn how to mount and dismount leaving my shoes on the bike. I think this will increase my transition times. Other than that, I wouldn’t change anything. I moved pretty quickly through T2. I have a good setup and got my gear on quickly. T2 was good to go, no changes. The run course was great, flat and fast. Out and back, I had the coast on one side and a residential area on the other. The course is mostly pavement with some sidewalk. The run for me was painful. I started out with a cramp on my right side. My legs also felt like bricks. I ran through the pain and it luckily went away by the turnaround. I was able to pick up my pace after that but my time was awful compared to my usual pace. I will definitely make sure to take in more salt and water before to avoid cramps during the run. I’m also going to try some more stretching which may help with my legs feeling so heavy going into the run. Overall the race was well-organized from beginning to end. Every part of the race and setup ran smoothly without problems or at least none that were noticed. 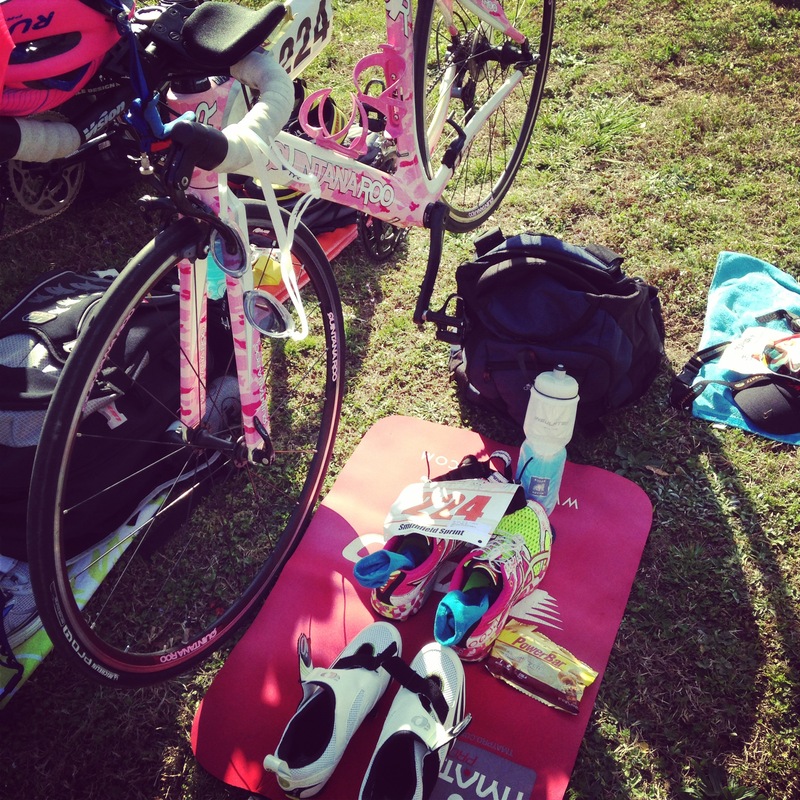 The swim, bike, and run course were perfect for a sprint triathlon. There were many enthusiastic volunteers at the race. Kudos to SetUp Events for a successful race!!! 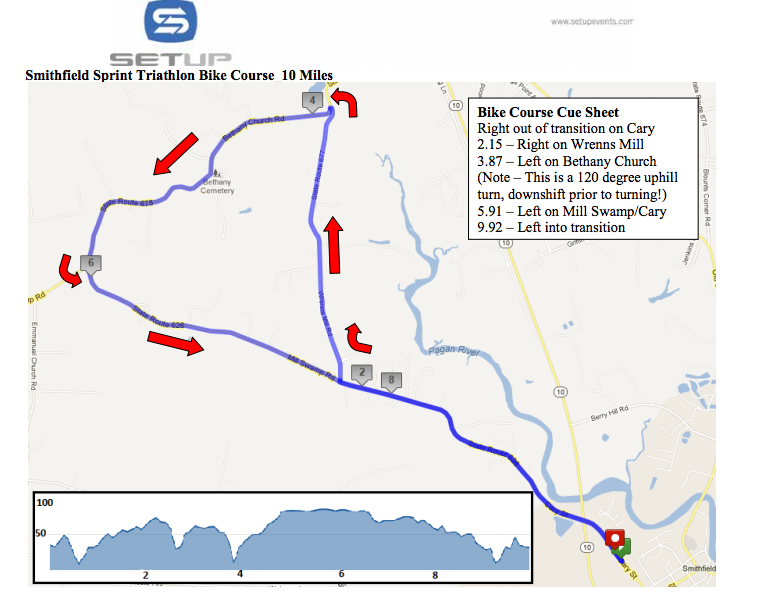 This entry was posted in Triathlon and tagged Beach, bike, Colonial, run, setup, sprint, swim, triathlon, USMC, Virginia on July 18, 2012 by usmctriwife.